Thermoluminescence is one of the dating techniques used in geochronology. This image shows the three stages of thermoluminescence. Geochronology is the science of determining the absolute ages of rocks, fossils, and sediments found on Earth. This field of science relies on a variety of dating methods, including those that are classified under the larger groupings of radiometric dating, luminescence dating, and incremental dating. There is a certain degree of uncertainty inherent within each method used, but the interdisciplinary approach of using several methods helps produce the best results. For instance, with reference to the geologic time scale, the Upper Permian (Lopingian) lasted from 270.6 +/- 0.7 Ma (Ma = millions of years ago) until somewhere between 250.1 +/- 0.4 Ma (oldest known Triassic) and 260.4 +/- 0.7 Ma (youngest known Lopingian)—a gap in known, dated fossil assemblages of nearly 10 Ma. While the biostratigraphic age of an Upper Permian bed may be shown to be Lopingian, the true date of the bed could be anywhere from 270 to 251 Ma. On the other hand, a granite which is dated at 259.5 +/- 0.5 Ma can reasonably be called "Permian," or most properly, to have intruded in the Permian. The science of geochronology is the prime tool used in the discipline of chronostratigraphy, which attempts to arrange the sequence and time of deposition of all rocks in a geological region, and eventually, the entire geologic record of the Earth. The aim of chronostratigraphy is to give a meaningful age date to fossil assemblage intervals and interfaces, as well as to determine the geologic history of the Earth and extraterrestrial bodies. It is, however, important not to confuse geochronologic and chronostratigraphic units. Geochronological units are periods of time, thus it is correct to say that Tyrannosaurus rex lived during the Late Cretaceous Epoch. Chronostratigraphic units are geological material, so it is also correct to say that fossils of the genus Tyrannosaurus have been found in the Upper Cretaceous Series. In the same way, it is entirely possible to visit an Upper Cretaceous Series deposit—such as the Egyptian mangrove deposit where the Tyrannosaurus fossils were found—but it is naturally impossible to visit the Late Cretaceous Epoch, as that is a period of time. As noted above, various dating methods are used in geochronology. Each method has a certain degree of uncertainty, but the reliability of the results can be enhanced by using several techniques. By measuring the amount of Radioactive decay of a radioactive isotope with a known half-life, geologists can establish the absolute age of the parent material. A number of radioactive isotopes are used for this purpose, and depending on the rate of decay, are used for dating different geological periods. With the exception of the radiocarbon method, most of these techniques are actually based on measuring an increase in the abundance of a radiogenic isotope, which is the decay-product of the radioactive parent isotope. Two or more radiometric methods can be used in concert to achieve more robust results. Most radiometric methods are suitable for geological time only, but some such as the radiocarbon method and the 40Ar/39Ar dating method can be extended into the time of early human life and into recorded history. Some commonly used radiometric dating techniques are given below. Radiocarbon dating: This technique measures the decay of carbon-14 in organic material (for example, plant macrofossils), and can be applied to samples younger than about 50,000 years. Uranium-lead dating: This technique measures the ratio of two lead isotopes (lead-206 and lead-207) to the amount of uranium in a mineral or rock. Often applied to the trace mineral zircon in igneous rocks, this method is one of the two most commonly used (along with argon-argon dating) for geologic dating. Uranium-lead dating is applied to samples older than about 1 million years. Uranium-thorium dating: This technique is used to date speleothems, corals, carbonates, and fossil bones. Its range is from a few years to about 700,000 years. Potassium-argon dating and argon-argon dating: These techniques date metamorphic, igneous and volcanic rocks. They are also used to date volcanic ash layers within or overlying paleoanthropologic sites. The younger limit of the argon-argon method is a few thousand years. Luminescence dating techniques observe 'light' emitted from materials such as quartz, diamond, feldspar, and calcite. Many types of luminescence techniques are utilized in geology, including optically stimulated luminescence (OSL), cathodoluminescence (CL), and thermoluminescence (TL). 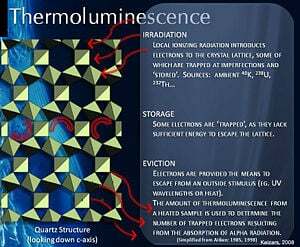 Thermoluminescence and optically stimulated luminescence are used in archaeology to date "fired" objects such as pottery or cooking stones, and can be used to observe sand migration. Incremental dating techniques allow the construction of year-by-year annual chronologies, which can be fixed (that is, linked to the present day and thus calendar or sidereal time) or floating. Marker horizons are geological units in different geographic locations but of the same age. They allow age-equivalence to be established between different sites. For example, tephra is often used in archaeology. The following table gives an overview of geologic time periods. The second timeline expands on the last subsection of the first timeline, and third timeline expands on the last subsection of the second timeline, as indicated by asterisks. ↑ David Weishampel, The Evolution and Extinction of the Dinosaurs (Cambridge, UK: Cambridge Press, 1996, ISBN 0521444969). ↑ R.E. Barrick and W.J. Showers, 1994, Thermophysiology of Tyrannosaurus rex: Evidence from Oxygen Isotopes, Science 265: 222-224. Retrieved February 15, 2009. ↑ J.B. Smith, M.C. Lamanna, K.J. Lacovara, P. Dodson Jr., J.C. Poole, and R. Giegengack, A Giant Sauropod Dinosaur from an Upper Cretaceous Mangrove Deposit in Egypt, Science 292: 1704-1707. ↑ P.R. Renne, K.R. Ludwig, and D.B. Karner, Progress and challenges in geochronology, Science Progress 83: 107-121. Retrieved February 15, 2009. ↑ A.P. Dickin, Radiogenic Isotope Geology (Cambridge, UK: Cambridge University Press, 1995, ISBN 0521598915). ↑ G. Faure, Principles of Isotope Geology (Cambridge, UK: Cambridge University Press, 1986, ISBN 0471864129). ↑ G. Faure and D. Mensing, Isotopes - Principles and Applications, 3rd ed. (Hoboken, NJ: J. Wiley & Sons, ISBN 0471384372). ↑ G.B. Dalrymple, M. Grove, O.M. Lovera, T.M. Harrison, J.B. Hulen, and M.A. Lanphere, Age and thermal history of the Geysers plutonic complex (felsite unit), Geysers geothermal field, California: a 40Ar/39Ar and U–Pb study, Earth and Planetary Science Letters 173: 285–298. Retrieved February 15, 2009. ↑ K.R. Ludwig and P,R. Renne, Geochronology on the Paleoanthropological Time Scale, Evolutionary Anthropology 9: 101-110. ↑ P.R. Renne, W.D. Sharp, A.L. Deino, G. Orsi, and L. Civetta, 40Ar/39Ar dating into the historical realm: Calibration against Pliny the Younger, Science 277: 1279-1280. Retrieved February 15, 2009. ↑ I.N. Demidov, Identification of marker horizon in bottom sediments of the Onega Periglacial Lake, Doklady Earth Sciences 407: 213-216. Retrieved February 15, 2009. Dickin, A.P. 1995. Radiogenic Isotope Geology. Cambridge, UK: Cambridge University Press. ISBN 0521598915. Faure, G. 1986. Principles of isotope geology. Cambridge, UK: Cambridge University Press. ISBN 0471864129. Faure, G., and D. Mensing. 2005. Isotopes—Principles and Applications, 3rd ed. Hoboken, NJ: J. Wiley & Sons. ISBN 0471384372. Lowe, J.J., and M.J.C. Walker. 1997. Reconstructing Quaternary Environments, 2nd ed. Harlow, UK: Longman. ISBN 0582101662. Smart, P.L., and P.D. Frances. 1991. Quaternary Dating Methods—a User's Guide. Cambridge, UK: Quaternary Research Association Technical Guide No.4. ISBN 0907780083. Weishampel, David. 1996. The Evolution and Extinction of the Dinosaurs. Cambridge, UK: Cambridge Press. ISBN 0521444969. This page was last modified on 26 May 2017, at 16:36.